Between the two huge land masses of North and South America lies tiny Central America. Barely wider than the state of Mississippi yet almost as long as Mexico, this subcontinent between giants packs an adventurous punch. There’s gurgling volcanos, luscious forests, and challenging hikes, but for water lovers, it’s truly a dream. There are 3,000 miles of prime Caribbean Sea and Pacific Ocean real estate and exceptional freshwater options, as well. You can paddle across vast lakes between towering mountains, carve down crowd-free glassy walls of water, traverse above coral reefs of lightning-bright colors, and find wind power to fill anybody’s kite with enough energy for some serious airtime. The region offers every aquatic endeavor you could want, and overland travel between different countries is relatively quick, cost-effective, and easily managed — when planned right. Here’s the best place to go, depending on your favorite watersport, and how to make the most of it. Just across the Mexican border, in the lush mountains of Guatemala, lies a 50-square-mile bowl of water, rimmed by sheer cliffs that rise into multiple volcanos. Lake Atitlan’s crinkly outline and steep sides provide shelter on even some of the windiest days, making this a perfect spot for paddle boarders of all experience levels. Because Atitlan has yet to be officially designated the world-class SUP destination it is, you’ll most likely find yourself stroking its fresh waters alone. 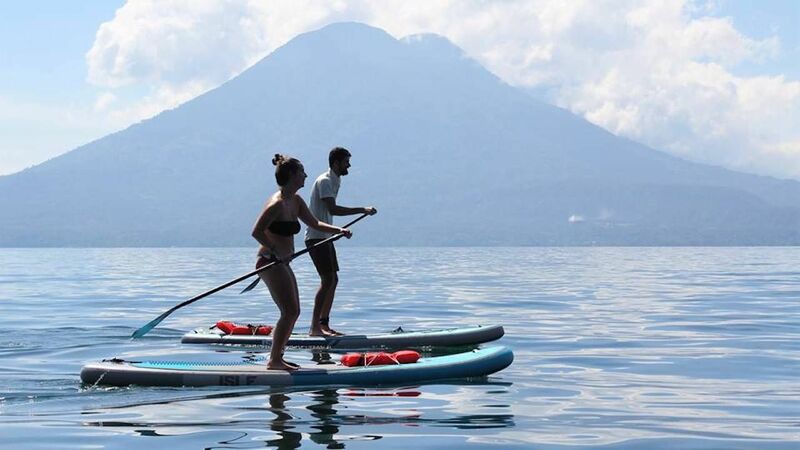 You’ll also find a few places to rent stand-up boards, like SUP Atitlan. While most people come here to attend the world’s cheapest, most spectacularly located Spanish schools, those coming for the water sports won’t be disappointed with the prices either. Keep in mind that at around three or four in the afternoon, a gnarly wind is likely to whip up out of nowhere. April to June and August to October are the calmest months on the lake. Amongst professional scuba instructors, the Bay Islands in Honduras are considered to have world-class training at competitive pricing. From open water courses right through to Master Scuba Diver Trainer and beyond, the schools on these two main islands have refined their operations to an exact science. In terms of dive courses and trips, the cheapest of the two green specks in the Caribbean Sea is smaller island Utila. There, you’ll not only have a pick of many accredited dive schools — the best of which are affiliated with whale shark research centers — but there is also a much healthier underwater experience to find here than around its larger counterpart. The coastline of Utila is protected on one side by humongous cathedrals of vibrant coral reefs. On the other, steep drop-offs descend straight down into the dark abyss. Those are natural features that impress at any time. 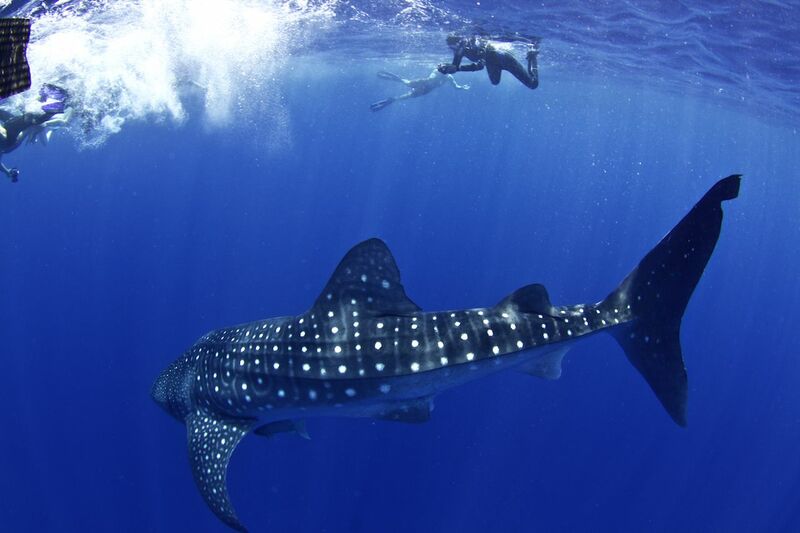 However, come at the right time of year and your scuba or snorkel mask will also be treated to whale sharks marauding between slits of sunlight, dolphins breaching through flat calm seas, and turtles taking lazy laps around the seven-mile length of land. October through December and March through April will be your best chance to see all three. Neatly sandwiched in the middle of Central America, this incredibly diverse country brings together some of the best scenic and cultural features of the whole region. On the eastern coast, explorers will find few stereotypical Caribbean-style beaches where speakers of Miskito Creole serve up succulent lobster tails for just a couple of bucks. The sapphire gem in Nicaragua’s Central American crown is the sprawling western coast that seems constantly pummeled by a pumping Pacific swell. This is a surfer’s paradise. Let your feet carry you north from Playa Maderas, board under arm, life’s necessities laden on your shoulders, and good times almost certainly ahead. While many of the well-known surf breaks have been over-colonized by wave hugging pseudo-hippies, there are plenty of waves waiting just beyond the well-marked tourist epicenters. After a soul-filling day of surfing or bodyboarding, there’s really only one way to finish: by cooking dinner on an open fire and camping under star-strewn skies. There are a couple of cost-effective campsites on and between Maderas and Playa Del Cinco. If you decide to camp for free on the sands, check tide and weather conditions first because a choppy sea could easily leave the senseless awash. Boards can be rented in the main town of San Juan Del Sur or at the most popular beaches for approximately $10 per day with discounts available for week-long rentals. For the best swells, hit those beaches from April to September. “Out of the midst of the beautiful Lake Nicaragua spring two magnificent pyramids, clad in the softest and richest green, all flecked with shadow and sunshine, whose summits pierce the billowy clouds. They look so isolated from the world and its turmoil — so tranquil, so dreamy, so steeped in slumber and eternal repose.” Famed traveler Mark Twain wrote this of the freshwater volcanic isle in 1866, and the quote is just as relevant today. No matter the month, most arrivals will first be struck by the island’s famously fierce easterly winds, whipped up over a vast and seemingly infinite lake before being struck by the undeniable mystical beauty of Ometepe. Lake Nicaragua, the largest in Central America, whips up consistent winds that drive kite enthusiasts of all kinds to fill their canvas on the island’s unsheltered shore. A key thing to know is that it’s not easy to traverse Ometepe without your own transport. By late 2018, there were only a handful of expensive taxis, an unreliable bus schedule, and one entrepreneurial tuk-tuk driver. Rental scooter your way to the east coast beaches, Santa Cruz and Domingo, to check out some seriously cheap accommodations. For just a couple dollars a night, I was able to rent a hammock in a rickety treehouse above the canopy with incredible island views dominated by the two cloud-topped volcanos, one of which is still active. The island’s highly regarded kitesurfing school, Sun Kite School, offers lessons and gear rental at a wallet-happy price. Although there’s a good chance of wind year-round, serious kiters will find the most stoke between December and March. 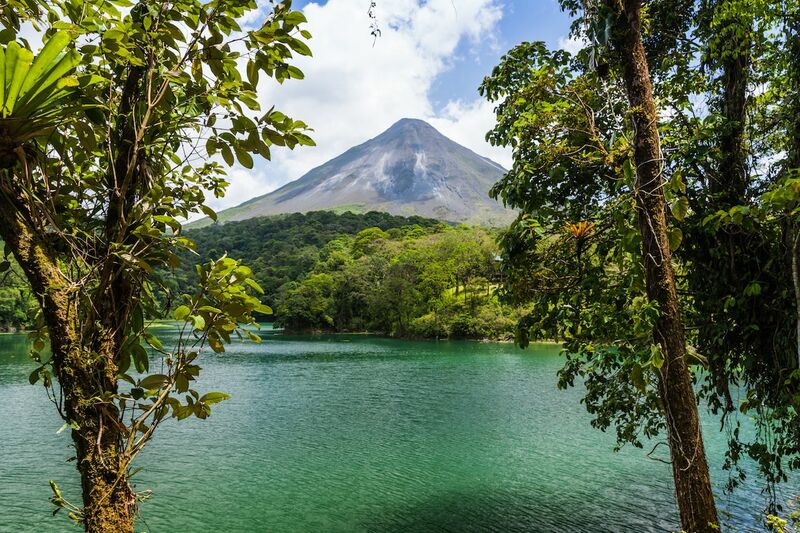 Deep in the northern highlands of Costa Rica, home to tapirs, sloths, and jaguars, you’ll find the country’s largest basin of water, Lago Arenal. Measuring 33 stretched-out square miles, the lanky lake funnels gusts from the heavens down its flanks. 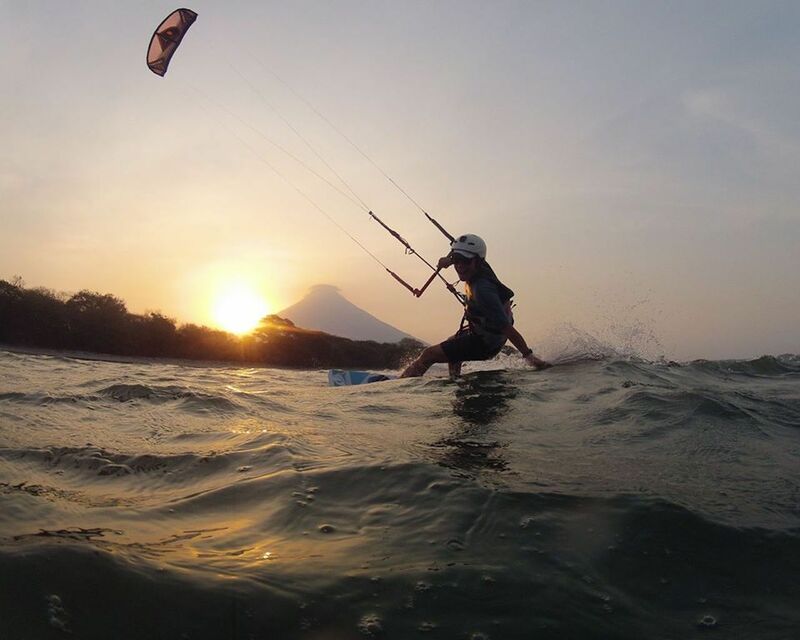 For this reason, the area has long been known as the windsurfing capital of Central America — able to fill sails enough for slow zips or quick whips in front of the awe-inspiring Arenal Volcano on most days of the week. The lake’s edges jag and jut, providing ample opportunity for shelter from the wind — spurring the rise of a new water sport in the area. Wakeboarding has recently taken off in a big way, and you’ll be sure to find plenty of boats offering a tow at reasonable prices. Best time of year for wind and kitesurfing is November through April while August to October has the calmest months for wakeboarding.